Last weekend, I ventured into Melbourne's heart; the CBD (Central Business District) for one purpose, to check out a new vintage fashion store with a difference, which has opened its doors in the Royal Arcade, off Bourke Street Mall. Hunter Gatherer on Brunswick Street in Melbourne’s Fitzroy has long been a must-visit retail destination for devotees of vintage, ethical and up cycled fashion. Now, the renowned Hunter Gatherer name comes to Melbourne’s CBD. I met with the lovely Andrea Philippou, Manager of Hunter Gatherer's Royal Arcade store, and as we discussed the love of all things vintage, and the potential hoarding of op-shop bargains, I browsed her little shop of pretty vintage clothing treasures. "We have a huge array of pieces to choose from", says Andrea Philippou. "The sorters at our warehouse have a keen eye, and know just what to look for. What you see at Hunter Gatherer is the absolute cream of the crop." "People are often prepared to give away beautiful, classic fashions they no longer have a use for, if it helps a good cause, and shoppers at Hunter Gatherer are the lucky ones to benefit from this generosity!" 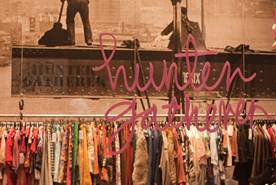 Hunter Gatherer is a Brotherhood business, so shopping with us makes for guilt-free retail therapy. By making a purchase at either of the two stores, you’ll be helping the Brotherhood of St Laurence to deliver its many programs and services, which prevent and alleviate poverty in Australia and help disadvantaged and marginalised people. Lets not forget Hunter Gatherer's upcycled products for sale. 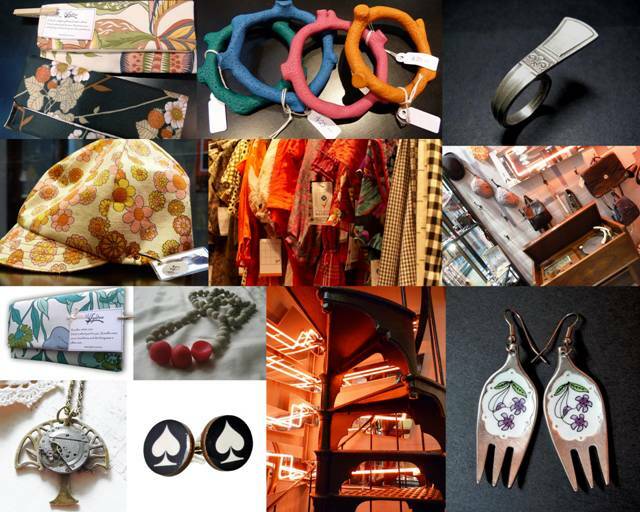 "We also carry boutique jewellery from Melbourne artisans including Greg Mann, who crafts using antique cutlery, Run Wild Horses, who turn vintage clock parts into steampunk-inspired pieces, Gabriella Hirst, who works with fimo to make necklaces and bangles with a coral look, and the sweet designs from Scrumptious Productions". Fans of upcycling will also adore the hats made of vintage fabrics from The Cat’s Pajamas and Lydra’s clutch purses fashioned from pre-loved fabrics. My personal favourite's were these cuff-links designed by Greg Mann, made with vintage teaspoons no less; a perfect accessory for a fitted ladies shirt. Check out Hunter Gatherer if you're in Melbourne! I am so happy I found your blog. I have a recycled boutique I would love for you to take a look. I googled Greg Mann!!! He is remarkable. I love his work. It's so beautiful and inspiring.